A team of engineers at the University of California San Diego and La Jolla-based startup Nanovision Biosciences Inc. have developed the nanotechnology and wireless electronics for a new type of retinal prosthesis that brings research a step closer to restoring the ability of neurons in the retina to respond to light. The researchers demonstrated this response to light in a rat retina interfacing with a prototype of the device in vitro. Despite tremendous advances in the development of retinal prostheses over the past two decades, the performance of devices currently on the market to help the blind regain functional vision is still severely limited — well under the acuity threshold of 20/200 that defines legal blindness. The new prosthesis relies on two groundbreaking technologies. One consists of arrays of silicon nanowires that simultaneously sense light and electrically stimulate the retina accordingly. The nanowires give the prosthesis higher resolution than anything achieved by other devices — closer to the dense spacing of photoreceptors in the human retina. The other breakthrough is a wireless device that can transmit power and data to the nanowires over the same wireless link at record speed and energy efficiency. One of the main differences between the researchers’ prototype and existing retinal prostheses is that the new system does not require a vision sensor outside of the eye to capture a visual scene and then transform it into alternating signals to sequentially stimulate retinal neurons. 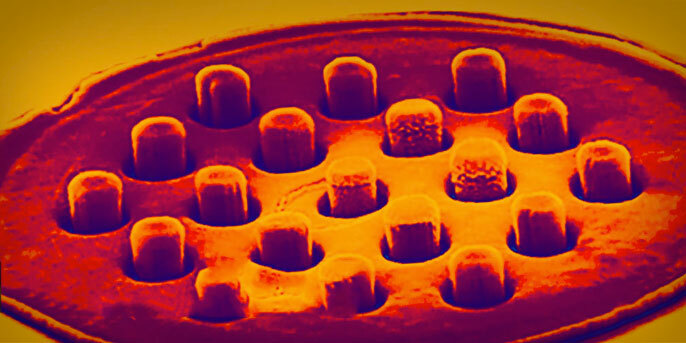 Instead, the silicon nanowires mimic the retina’s light-sensing cones and rods to directly stimulate retinal cells. Nanowires are bundled into a grid of electrodes, directly activated by light and powered by a single wireless electrical signal. This direct and local translation of incident light into electrical stimulation makes for a much simpler — and scalable — architecture for the prosthesis. “We have made rapid progress with the development of the world's first nanoengineered retinal prosthesis as a result of the unique partnership we have developed with the team at UC San Diego,” said Thorogood, who is the CEO of Nanovision Biosciences.